Hartlepool United manager Ronnie Moore admits he wil not rush top goalscorer Billy Paynter back from injury - despite Pools’ desperate need for points. Paynter has been sidelined since November after surgery on an Achilles injury and Moore said his captain “isn’t too far off” from making his comeback. Paynter remains the club’s top scorer with seven goals despite missing over two months with the injury. Moore said: “He has done well. “He is still working with Buster (club physio Ian Gallagher) and it is so important, since he has been out that long, that you don’t bring him back too early because you are chasing things. Pools have struggled for goals since his injury, with strikers Scott Fenwick and Rakish Bingham scoring just seven goals between them this season. Moore said: “You are always going to miss somebody who, at the time, is our top goalscorer, not only that, but the experience he has. “He knows the game inside out. “The ball sticks when it is up there and gives the defence time to get out and a breather. “He buys free kicks for us, so you can’t buy that experience. “Scotty Fenwick is still learning the game. “Rakish is a young lad so they are still learning. 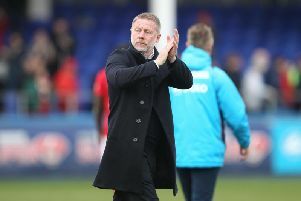 Moore has shown no hesitation in expressing his need for a striker in the transfer window, and believes another forward will still be needed when Paynter returns. “It could be a quick lad, it could be a big lad, it doesn’t really matter to me. “Maybe a quick one and a big one, and we could see whether Billy could play with the big one or the little. Pools’ festive schedule was decimated by the weather, with four postponements, meaning the club have 10 games before the end of February. Moore believes the high number of matches will prove difficult for Paynter during his comeback. “He is one, when he does come back, that he will not be able to do Saturday, Tuesday, Saturday, Tuesday all the way through.